Direct from Osaka, Japan, where everyone is making a fool on each other, THE 50 KAITENZ (pronounce Go Jyu Kaitenzu) is an absolute miracle of Osaka humor and in fact they are the top secret of the recent Japanese garage rock scene! 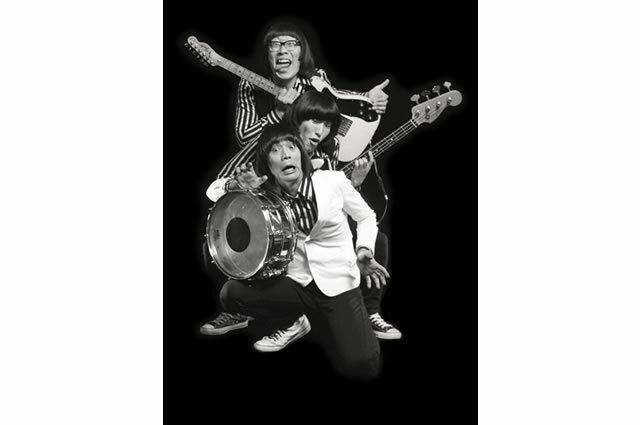 Dressed in matching black slim suits and setting their hair like Beatles or Ramones, Danny (G/Vo), Dory (B/Vo) & Bogie (Dr/Vo) look just like the typical Osaka comedians. But once they jump on the stage, the whole room will be shaken down by their very entertaining, energetic rocking typhoon! Yes! The 50 KAITENZ not only will rock you hard but will also make you laugh hard!! Their music is deeply influenced by Ramones, Dr.Feelgood, Chuck Berry, Mummies and 60’s Japanese group sounds. Although they sing songs in Japanese, it won’t get you lost in translation because soon you will see that there is no language barrier in THE 50 KAITENZ hyper rock n roll show! You just can’t stop dancing along to it! To celebrate the release of their debut album “THE 50 KAITENZ No Gya” (Warner Music Japan) recorded in San Francisco, Kevin Inc Studio (Phantom Surfers, The Residents) with an exceptionally talented producer Koichi Hara (Boredoms), THE 50 KAITENZ are just about to tie up their FUNDOSHI and make their way to Australia for the first time ever.